Guido Reni(1575/1642), 'Testa di Cristo coronato di spine', c.1630, Detroit Institute of Arts, Detroit-USA. 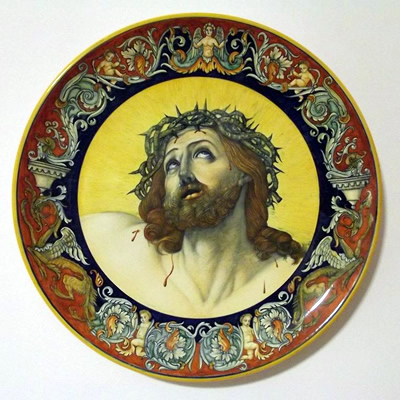 Reproduction on ceramic plate. ● Tradition - Faithful to a secular scheme, following day by day the history of Deruta, our work leads us to combine together the 4 basic elements: earth, water, air and fire. The earth, the clay that is raw material of our handcrafted products. The water, which is fundamental for shaping the material. The air, that gives stability to the structure. The fire, that temper the material, gives light, colour and life to our art. ● Innovation - Connected to the tradition, our desire to improve and to experience, and also through the cooperation with many famous international architects and designers, lead us to a continuous search for new solutions, inspired by the idea of restyle shapes and classic patterns, to suit the taste of modern house furniture. ● Quality - Following the art and the tradition of Deruta, in our workshop, we produce handmade ceramics only. Each handcrafted item created by the expert hands of our master craftsmen, is the result of a process that is repeated unchanged from centuries. Every single piece is subjected through several checks on every stage of the working process. The "Warranty Certificate" supplied with each piece, represent the authentication and the assurance that the all the items are really done by hand and made in our factory in Deruta.